Say what you will about the fate of Sony's Android tablets, but the company surely knows how to make a product placement, as numerous movies can confirm. This time a Sony Android tablet was given to the Pope Benedict XVI himself, for the holy task of lighting up the world's largest Christmas tree setup, which is located in Gubbio, Italy. The "tree", which is made up of an arrangement of coloured lights on the side of Mount Ingino, has been erected by volunteers every year since 1981. Its base is approximately 450 metres wide and it extends for 750 metres up the hillside from the city's mediaeval walls to the basilica of St. Ubaldo. The silhouette of the tree is marked with 300 green lights, and it covers a surface area of some 130,000 square meters illuminated with 400 multicoloured lights. At the top is a comet made up of 250 lights covering an area of 1,000 square metres. The tree is illuminated every year on 7 December, during a traditional celebration attended by representatives of the world of culture, show business and politics. Benedict XVI will activate the illumination from his apartments in the Vatican Apostolic Palace. He will touch the screen of a Sony "Tablet" with an "Android" operating system which, via the Internet, will transmit the command to switch on the electric current to the tree. 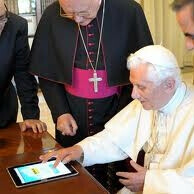 The Vatican press release doesn't specify if it was a Sony Tablet S, but putting "Tablet" and "Android" in quotes smells Android rookie to us, we've seen the Pope play with an iPad before to send his first tweet. Daniel P, why do you even feel the need to mention the Ipad ? whats the point in what your saying ? why does a troll troll? Maybe the pope realized that he could have only one religion. Catholicism. Daniel, that last sentence makes no grammatical sense. Joke? Missed. But It could still be clever marketing if done correctly. Imagine the commercials!! It would be hilarious. Daniel P = ifan?? damn i though this web was neutral??? what was the last sentence for??? to start a flame??? He has the right to mention iPad, XOOM or Kindle fire on his article. He did not tell anything bad here or anything against to Android. I think android fans will be happy if the writer mention Galaxy Tab here. Most of the android fan boys criticism about the article here are baseless. I am a regular reader of PA. In my experience android fan boys are more adamant than ifanboys. I am asking from all fanboys, please don't make bad impression about this nice site (by posting your baseless comments) among young reader who come here to get knowledge about technology.